We leverage the latest technologies, from proteins to cell and gene therapies. An antibody therapy approved for the treatment of adults with moderate to severe plaque psoriasis, and being investigated for multiple immune-mediated inflammatory diseases. 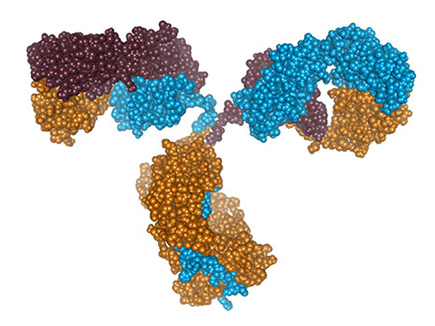 We deliver next-generation antibodies, which utilize bispecific and protease-resistant Fc and silenced Fc platforms, to generate “fit-for-purpose” antibodies for use across therapeutic areas of interest, including Oncology, Immunology, Cardiovascular & Metabolism, and Infectious Diseases & Vaccines. Bivalent and tetravalent bispecific antibody platforms offer unique treatments for oncologic conditions, including targeting and killing cancer cells and activation of the immune system. As part of these platforms, IgG-centyrin (MAbtyrin) and IgG-fynomer (FynomAb) fusions are being explored for multi-specific targeting with high avidity. Fc engineered antibodies in development include silenced Fc IgGs for targeting immune and metabolic cell types, IgGs with hyper-Fc activity for targeting pathogens and tumor cells, and protease-resistant IgGs with a variety of potent Fc activities for targeting pathogens, as well as the highly protease-rich tumor microenvironment and inflamed tissues that are high in protease activity.